In epic true-crime fashion, David Fincher’s Zodiac uses its serial killer as the springboard for a massively complicated police procedural, thus his picture’s main focus: obsession. Following a linear timeline, we start with the murders committed by San Francisco’s notorious Zodiac Killer, his frantic media exposure, his letters to the press, and the unfortunate bureaucracy impeding the investigation. But during the second half, even though the killer’s letters and murders stop, the remnants of the heavily publicized investigation still affect the police and reporters involved. Based on Robert Graysmith’s book Zodiac Unmasked: The Identity of America’s Most Elusive Serial Killer Revealed, the author (played by Jake Gyllenhaal), once a cartoonist for the San Francisco Chronicle, becomes the film’s most fascinating, obsessed, and self-destructive character. The facts of the book are reviewed in a downward spiral of suspense and obsessive fact-checking. 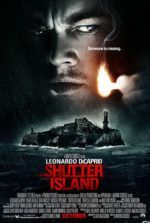 Moreover, the film avoids the now clichéd movie storyline that fictionalizes the unknowns of a real-life killer; the finale of the film ends as the book does, with a powerful but improvable hypothesis. Fincher, renowned in this genre for the grisly film Se7en, depicts Zodiac’s murders with incomparable technical and dramatic skill. Watch the scene where Zodiac ties up two lovers near a lake and proceeds to stab them; as viewers, there’s almost a physical reaction because the violence it’s shot so well. We want to look away, but can’t, even though watching almost seems to hurt. For each murder scene, the killer is portrayed by alternating actors whose faces remain hidden by shadow or Zodiac’s signature mask, so viewers know someone fitting the killer’s description is there, but we cannot identify who—we’re left in the dark as much as the investigators are. With only a handful of victims, and most incidents leaving a survivor, the Zodiac’s reputation was exaggerated by the press. His letters to the SF Chronicle discuss future murder plans, contain moderately-elaborate codes, and demand their publication as front-page news. The killer even contacts celebrity lawyer Melvin Belli on national television, asking for help. (Belli represented Errol Flynn, The Rolling Stones, and Muhammad Ali in various cases. Brian Cox plays him with an appropriate fusion of class and sleaze.) It’s assumed the killer’s desire for attention fuels his need to kill. 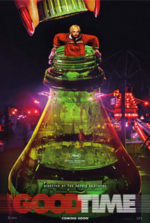 Journalist Paul Avery, played by Robert Downey Jr., feeds the killer’s superstar status, but also treads dangerous ground by fabricating material to sell papers. A self-destructive, alcoholic drug user, Avery does whatever he can to keep the Zodiac’s presence, thus his own name, in the papers. Downey Jr.’s ability to quickly prattle off dialogue with casual naturalism has served him in films like A Scanner Darkly and Kiss Kiss, Bang Bang, and it serves him here too. His role is small but shines among this impressive ensemble cast. The police investigation is led by two detectives, Toschi and Armstrong (Mark Ruffalo and Anthony Edwards, respectively), who find because the murders took place over several police jurisdictions, organizing their investigation is nearly impossible. 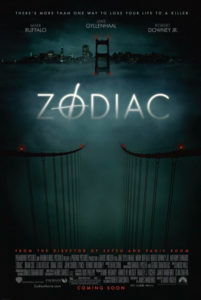 At best, because of the jurisdictional ruling and uncooperative small town police departments, Toschi and Armstrong are left with only seventy percent of the available facts on Zodiac’s murders occurring outside of San Francisco. 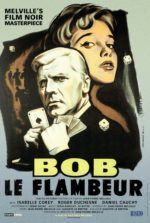 Moving from suspect to suspect, when the two detectives eventually find someone they think may be the Zodiac, legal edicts prevents them from pursuing it. Unlike Brian De Palma’s The Black Dahlia, which developed a silly Hollywood melodrama around the true-life killer, Zodiac doesn’t allow its audience the satisfaction of knowing the killer’s identity. We’re left with the actual facts the case, as incomplete as they may be. I was dreading another cliché explanation scene, where all is revealed, leaving the audience contented, utterly gratified viewers. Instead, Fincher leaves us with Graysmith’s frustrating, heart-stopping conclusion: we know, but can never really know. It’s pleasing to see a film not cater to the audience in every-which-way, and instead weave us tightly and severely into facts. Fincher’s visual style stays restrained, even understated compared to his other work. In Alien 3, Se7en, and The Game, the intense and appropriate darkness reflected the main characters or the setting. In Panic Room and Fight Club, Fincher’s elaborate CGI-enhanced camerawork took us places no real camera can go: inside keyholes; through coffee cup handles and narrow railing posts; from the pores of a forehead, between eyebrows, and then up along the barrel of a gun. Here, Fincher’s use of CGI is flawless and indiscernibly integrated; he used massive blue screens to wash out modern background cityscapes, later replacing them with 1970s-specific backdrops. Zodiac’s bravado camerawork doesn’t immediately grasp your attention to the apparatus as his previous, above-mentioned works might. His camera follows a cab from a bird’s eye view or takes us high above the Golden Gate Bridge with impossible shots that, though enhanced or wholly created with CGI, attest to the filmmaker’s remarkable dedication to his film’s mise-en-scène. Zodiac wraps us in the case’s facts; we know names, dates, places, and suspects. We become just as paranoid and overwrought with the desire to know as Graysmith, Avery, Toschi, and Armstrong. While the true-crime investigation thrills, since the killer’s identity was never actually proved without a doubt, we aren’t given Hollywood’s usual closure. No, nor even a resolution. Fincher understands that his characters build and build and build their case until… nothing. And that’s the brilliance of this drama: wrapping us up in characters who survey never-ending details, and then leaving us with their same unfulfilled obsession.